So with all the talk about safety that's happening I didn't want to focus on the obvious safety tips. I'm assuming that if you've been running for awhile (or exist in the world as a human being) you are aware of what behaviors could keep you safe and you have probably already incorporated those into your day-to-day. Today I'm going to focus on some tools (aka apps) that might help you if the worst should happen. No one goes out for a run thinking they'll turn an ankle, run out of water, or maybe something worse, so having these might help alert someone if you do get caught. If you run with your phone anyways, these will be easy to implement! The app has 2 main safety features, the eCrumbs and Lock Screen. The eCrumbs is your live updated system. You set up the activity and fill in a few details so that you have the ability to live track. Notify These People (5 Max) - Selecting this will open up your contacts (allow access) so that you can set up anyone to track your run. They can see the tracking and they get notified if needed. 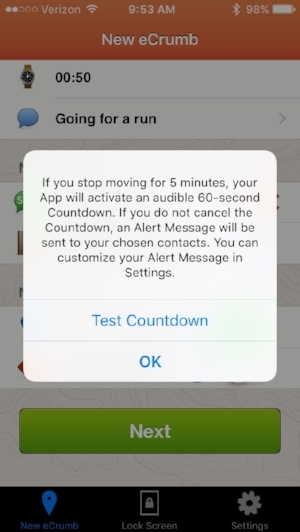 Stationary Alert - As described below if you stop moving for 5 minutes, the app will start an audible 60 sec countdown. If you don't cancel it then the chosen contacts will be sent a text message. You have the option to turn these on or off so you can either have a tracked run with no stationary alert or turn off tracking and ONLY use the stationary alert. Pretty nifty! Once you select "Start eCrumb" you'll start your activity. You're eCrumb contacts will get a text message that you began your activity! When your done you just slide the red arrow button and your contacts will get a text saying you have completed your workout. Note: For this mode, in the app settings menu you can select "battery saver" mode which will slow the rate at which updates are sent. When you battery is at 50% it'll slow the location update to once every 4 sec and when your battery is at 25% it'll slow to every 6 sec. The other, simplier, and less costly (from a data usage perspective) is the Lock Screen set up. Basically the app helps you set up some data and let's you save a static image that you can make your phone's lock screen. Pretty handy! Similar to the physical Road ID bracelets and shoe add-ons you can wear, you set up a few contacts and some basic info (allergies, medical conditions or other info is recommended). You then select "Preview" and check that everything is accurate and displaying correctly. if everything looks good, select "Save" and you get the below tutorial on how to set up the image as your lock screen. Pretty nifty, cheap and a great way to keep yourself safe! Once you've downloaded the app and done all the pairing needed for your regular watch/app set up it's pretty easy to turn on the live tracking feature. You'll select "More" in the bottom right and scroll until you see "LiveTrack". Clicking that will open a screen that looks like the one on the right. Each way will send a message with a link that your friends can click that will open up a live map. If you have connections or groups on Garmin Connect, you can also set it up so they can track you which is fun! Note: When I set it up to send a notification via email, Facebook, and Twitter it sent everything in triplicate so it's not perfect. I also wish it had a SMS option because texts are still probably the most efficient way for someone to be alerted to a need. I found this overview video posted by Shane Miller of the Daily Lama which I think gives a quick summary! Once you are a Runkeeper Go subscriber you'll just select "Private" and set up your sharing setting for that activity. Super simple! More useful tips on the Runkeeper blog: Never Miss Your Cheering Section Again! What's your favorite running app? 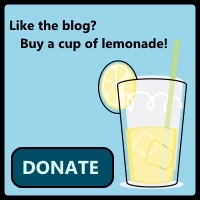 Do you enable live tracking? Let me know in the comments below! So grab your phone and arm yourself with a few more tools to keep you safe and put your friends and family at ease. Happy running!